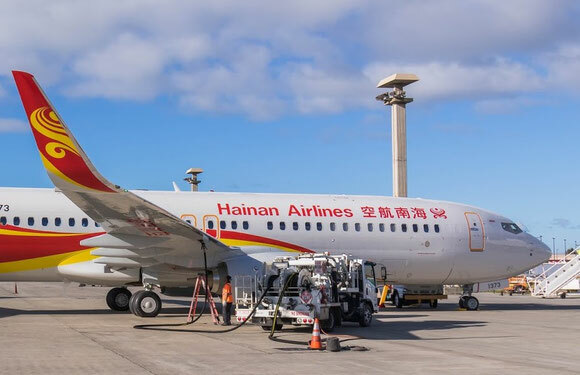 Hainan Airlines Holding, the airline division of embattled mainland Chinese conglomerate HNA Group, has settled missed fuel payments with South China Bluesky Aviation Oil, a subsidiary of China National Aviation Fuel Group. The Guangzhou-based fuel company had threatened to halt supplying fuel by March 16 if the airline failed to settle outstanding fuel bills since October 2017. The airline is currently negotiating payment for liquidated damages with the fuel supplier, as well as establishing a long-term plan for paying off future fuel bills. Reports said that fuel expenses have become the biggest operating cost for Chinese carriers. Hainan Airlines Holding’s fuel costs reached CNY7.9 billion (US$1.2 billion) in 2016, accounting for 25% of the carrier’s total operating expenses. Separately, the South China Morning Post reported that the HNA Group is stepping up its disposals of assets with plans to sell a clutch of office buildings, hotels and other property to repay debt taken on its recent rapid overseas expansion. The assets to be sold include the Shanghai HNA Tower, the Shanghai Yangtze International Enterprise Plaza and the Renaissance Shanghai Pudong Hotel, Bloomberg reported, adding that the combined book value of the properties is about US$2.2 billion. HNA could not be reached by CargoForwarder Global for comment on the proposed property sales. The SCMP quoted media reports which said the HNA Group intends to sell 100 billion yuan (US$15.8 billion) of assets in the first half of this year. Earlier this month, HNA announced plans to sell its US$1.4 billion assets in the Hilton Worldwide Holdings hotel chain Park Hotels & Resorts Inc., while in the past months, HNA has reduced its holding in Deutsche Bank and sold properties in London, Hong Kong and Sydney. In Hong Kong, it has sold three of its four plots of development land at the former Kai Tak airport.